Discover the amazing animals that live in the lush rainforest, with this gorgeously illustrated book of natures hidden habitats. 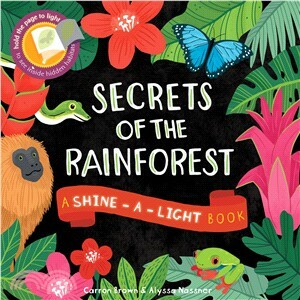 By simply holding the book up to the light, or shining a light behind each page, young children will be able to discover the animals and plants that live in and around a kapok tree, from the colourful parrots in the canopy, to the sleek jaguar on the forest floor. The innovative see-through feature fulfils a similar function to lift-the-flaps books, but has the added interactive dimension of the child being able to see both the surface and the hidden picture at the same time.